The Beijing Olympics focused the world’s eyes on China. But despite increased tourism and rampant foreign investment, the cultural distance between China and the West remains as vast as the oceans that separate them. The Middle Kingdom is still relatively unknown by Westerners. 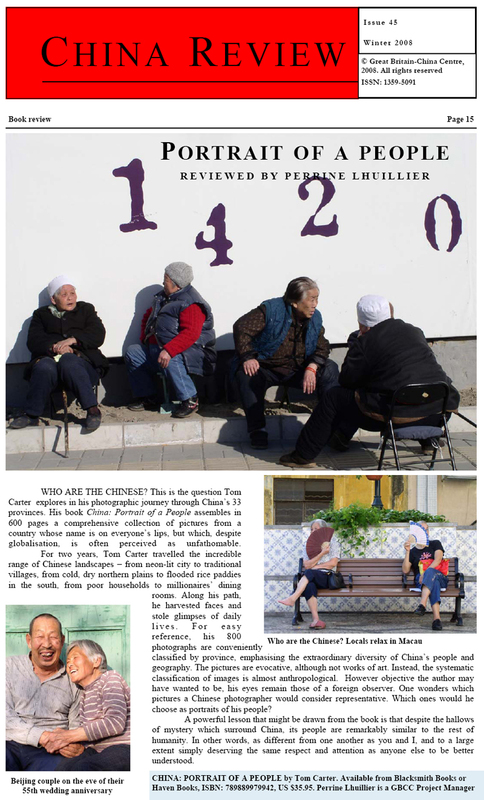 China is in fact made up of 33 distinct regions populated by 56 ethnic groups – and American photojournalist Tom Carter has visited them all. This little book is a visual tribute to the People’s Republic of China, with an ardent emphasis on the People. The Beijing Olympics focused the world’s eyes on China. But despite increased tourism and rampant foreign investment, the cultural distance between China and the West remains as vast as the oceans that separate them. The Middle Kingdom is still relatively unknown by Westerners. China is in fact made up of 33 distinct regions populated by 56 ethnic groups – and American photojournalist Tom Carter has visited them all. This little book is a visual tribute to the People’s Republic of China, with an ardent emphasis on the People. CNNGo stopped Tom Carter before his talk at Shanghai’s Glamour Bar to get some insight into his “beautiful and groundbreaking 600-page photo collection”. 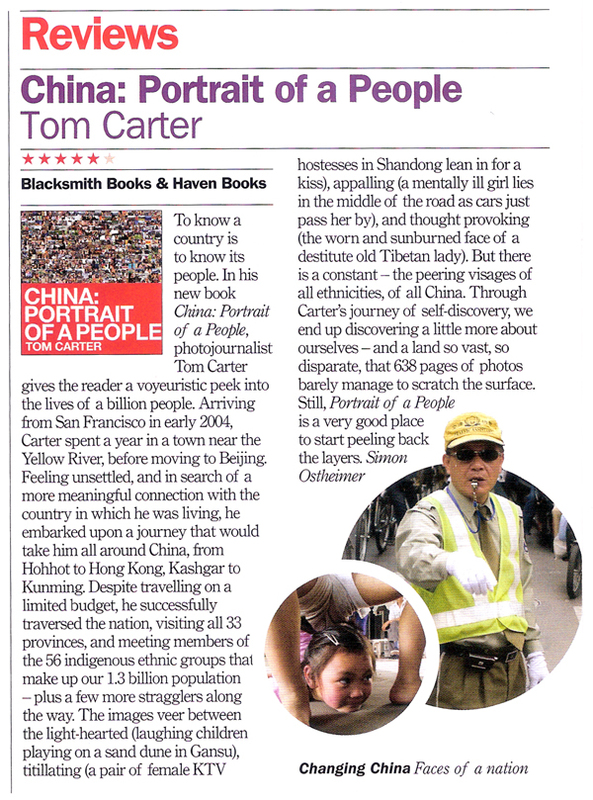 “With the international release of his book this summer, the rest of the world can now tag along on Carter’s eye-opening journey through China’s biggest cities and far-flung regions and discover what China really looks like.” CHINA: Portrait of a People is the cover story for Shanghai Talk Magazine. China Travel 2.0 asked Tom Carter about seeing China on a shoestring. Michael Herborn at Play the Game for Open Journalism interviewed Tom Carter about his work as a photojournalist in China. Have Camera, Will Backpack — Yao Minji of the Shanghai Daily quizzed photojournalist Tom Carter about his groundbreaking travels around China. Read the story here. 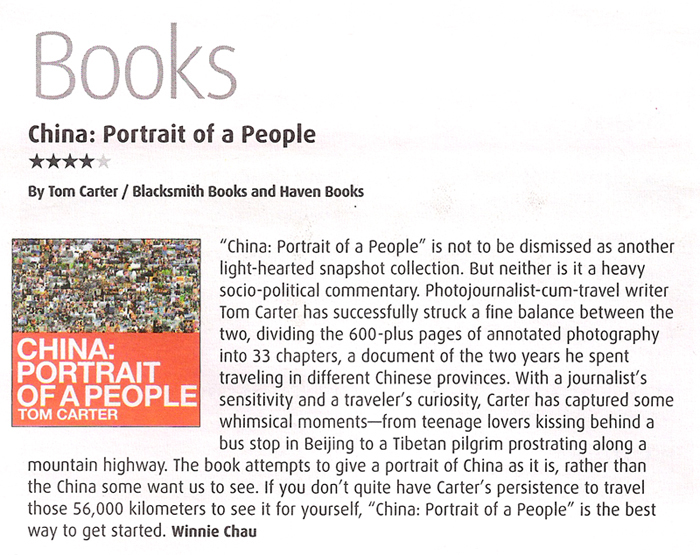 Quest for photo book on Chinese people set to end in Hong Kong — read the South China Morning Post clipping here. An inveterate vagrant who flirts with pictures and words, Tom Carter spent two straight years backpacking a groundbreaking 35,000 miles across all 33 Chinese provinces, and was named “one of China’s foremost explorers” by The World of Chinese magazine. 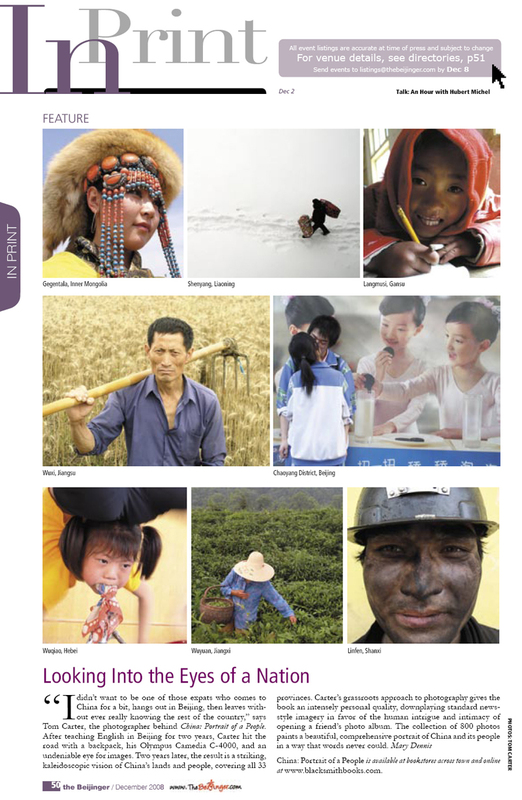 His first book CHINA: Portrait of a People has been hailed as the most comprehensive book of photography on modern China ever published by a single author. He is also the editor of Unsavory Elements, an anthology about foreign expats in China. Tom was born and raised in the City of San Francisco, graduated with a degree in Political Science from the American University in Washington, D.C., and has called China home since 2004.